The Horlivka Diocese was one of the first dioceses of the Ukrainian Orthodox Church on whose territory fighting began. Sloviansk in April-June, Horlivka from June to the present day. 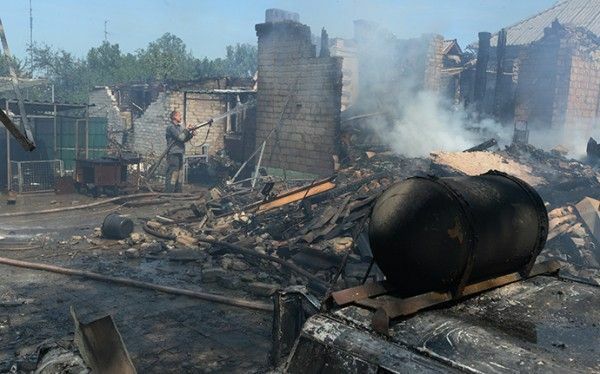 These are dreadful days for Archbishop Mitrophan of Horlivka and Sloviansk and his flock. Pravmir had an exclusive interview with him. 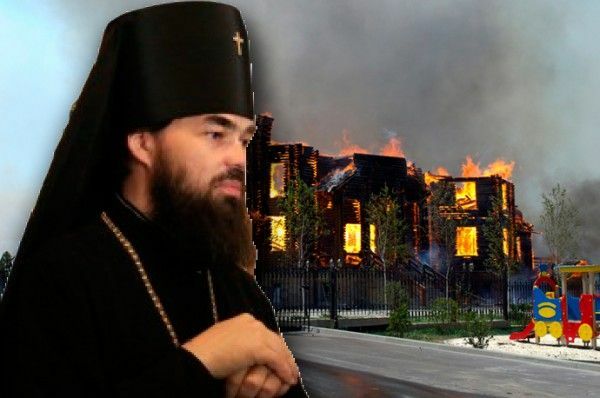 Vladyka, your dioceses have been under fire for months; there is a war going on. What seems to be most important right now in your ministry, in the ministry of a bishop? I would like to speak not only of the ministry of the bishop, as the question was placed, because in the Donbass we have more than one bishop. 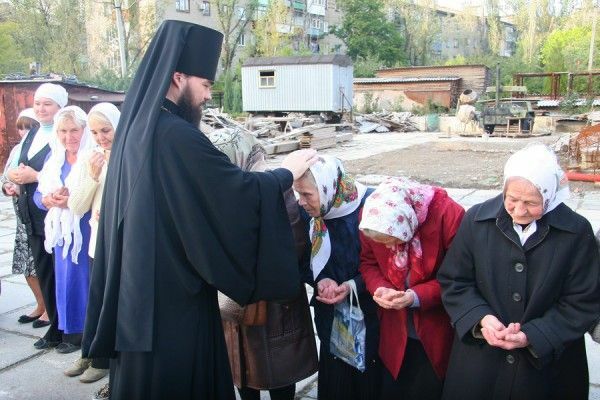 We have six bishops in the Donetsk region alone, who serve and do not go anywhere. And there is still the Lugansk region, where three bishops serve. 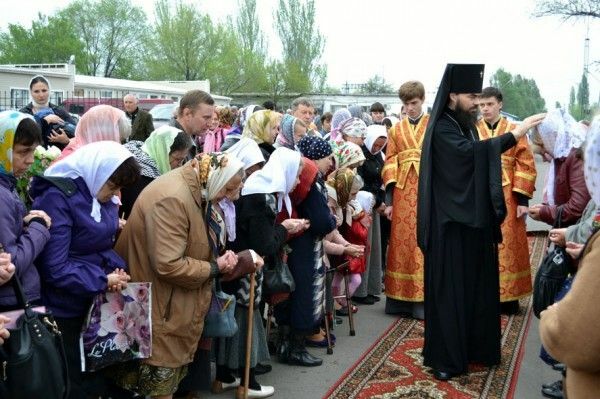 Hundreds of priests are in service in the Donbas. Yes, there are some who left, but the majority stayed, for which reason it would not be correct to speak about the ministry of one or two people. The whole Church is serving. The war is not just explosions, not just attacks, not just bombing. This is also empty cities, a destroyed infrastructure, broken lines, and broken lines of communication – even relatives in neighboring towns have lost the ability to communicate with each other, because there are roadblocks and curfews in the combat zone. It is also divided in half by a family that has different views on current events. The war is the shortage of basic things that we are all used to: there is no light, nor water, nor salary for several months; there are queues for bread and requests for the very most necessary. The war is also a longing in people’s eyes who do not see the future and do not know how this will end. It is thousands of refugees, who abandoned their homes to try to escape the fighting, and from the ground up are trying to begin their lives in a new place or living in refugee camps. It is stopped factories and enterprises; these are people who have lost their jobs and a piece of bread and do not know how to go on living, and much more. It is clear that in this extreme situation, that the number of people who are looking for support in the walls of churches is very great. And today, like never before, it is important that at the moment someone comes to church to look for support, that a priest be on duty, so that he wouldn’t despair, so that he and his words and prayers, and services, and even appearance, can show people some kind of support. Today it is likely unnecessary that a priest try to publishing a wall newspaper or journal, or conduct an Internet page, or run somewhere to seek out something to bear witness to, or organize a holiday. In our conditions, it is enough that he simply sat in his place, communicated with people, and helped them – and this will already by, in my opinion, an enormous missionary force. People cannot be thrown away and , finding ourselves next to them, a priest can help them with very much, beginning with the simplest everyday questions: for example, organizing the feeding of the needy in the parish by the parishioners, those opportunities that they have with a priest. Not all parishes can afford this, but priests take care of this on the plots of parishes. They can show whelp to those people who are in the most difficult circumstances, for example, in psychiatric hospitals. Everyone forgot about them, but the priests travel there, help the doctors and nurses, who are there to care for the sick, simply because their conscience does not allow them to leave them behind. Everything that needs to be done during peacetime, needs all the more do be done now. And of course the main thing is not to lose heart, because when a war lasts a week or two, many are ready to bear it; but when it lasts months and its end is not visible, then the situation is considered more serious, and that more effort, courage, and patience are needed. This is probably like having a toothache: his tooth might heart for a single day or for a week. Someone whose tooth hurts for one day, does not yet go to the dentist, thinking: “maybe it will resolve itself.” Because he does not want to pull a tooth. But after it has ached a week, he decides he does not want it to hurt anymore. The same thing happens with someone who is willing to put up with a war for a day or two. Everyone wants to see some kind of perspective. And a priest must be around the people when it gets difficult. Even a year ago, it was impossible to imagine that there would be a war, and that it would be such a terrible and fratricidal one. What, in your opinion, can we now do to stop the bloodshed? This is not a question for the clergy. Those who started it can end it. Naturally, this war did not begin in the Church. In global terms, we know how to end the war: stop shooting, ask forgiveness, return to the point of view from which it started to give up all those things that are acceptable to both parties, and to each very large concessions. All this is clear to any reasonable person. What do you think? Are people ready today to hear the voice of the Church? And is there any point in speaking, if the combatants are not ready to hear? What is the task of the pastors during the war? The Holy Church cannot stop the war, but can contribute to the war ending, if it speaks to the people from which this depends. The Church can help those same people who are in no way involved in the fighting, but it very much suffers from them. Is it necessary to speak of people? Is it necessary to speak of the cessation of bloodshed? Of course, it is. Even if they do not listen to you, even if it seems that no one needs this, one still needs to testify about this. But the Church does not simply speak about this; the Church asks God for this. Every day, at every divine service, there are petitions for the restoration of peace, for the termination of bloodshed. A special petition for the departed sounds forth at every divine service, because every day new victims of this conflict appear. If everything had depended upon the Church, there would have been no war. If they had listened to the Church, there would have been no bloodshed, there would have been no war, there would have been no violence. If we had fulfilled the laws of God and living according to the, one could say that there would be paradise on earth. Namely because man, at some moment, fails to fulfill God’s will, and begins to fulfill his own evil will or to pass on to others their own passions, that we see the result. What is your flock asking you today? What excites people? What do you speak about with parishioners? About everything. Many want to know our exact assessment of the war. Unfortunately, I do not have an answer to this. Everyone really wants to see the light at the end of the tunnel. I reply that we do not need to name these dates ourselves: say, over the coming week or the coming month, because a week or a month comes and nothing changes, but everything grows more disheartening. Everyone wants to start to think of something else apart from the war and of how to survive these circumstances. Purely domestic issues, questions of survival, have today come to the fore, and we are trying to help people as much as we can in these questions. Of course, we try to start a conversation about how is to blame, who started things, who is right, how to stop it all – but of all this one can speak endlessly. One already cannot find either the innocent or the guilty, because the conflict has taken on enormous proportions, a multitude of people are retracted in this, there are many victims, who already have a personal account and do not just speak in the abstract. Of course, you need a lot of patience, love, and time to live again in peace, to live together again. Do you remember the first day that you were under fire? 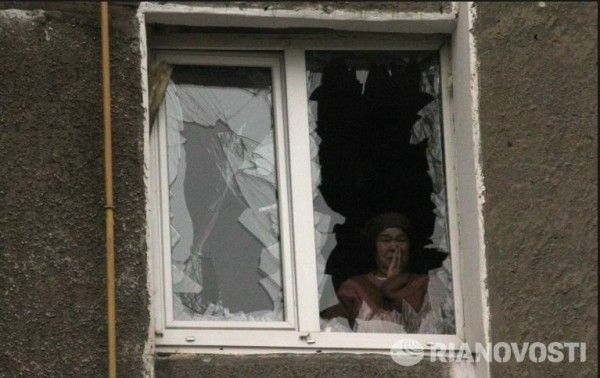 For me, the war did not begin in Gorlovka, but in Slavyansk. On the first day of the war I went to Slavyansk, because the rector of the St. Alexander Nevsky Cathedral called me to say that there was an enormous number of people around the cathedral who wanted to be let in. People were afraid that the troops would come and there would be massive killing, and they thought that they would not be touched in church. The rector did not know what to do, and said, of course, let people gather in church and stay there for as long as they want. Arriving in Slavyansk, I saw that the entire city was on the street, bridges and roads were covered, and helicopters flew over the city. 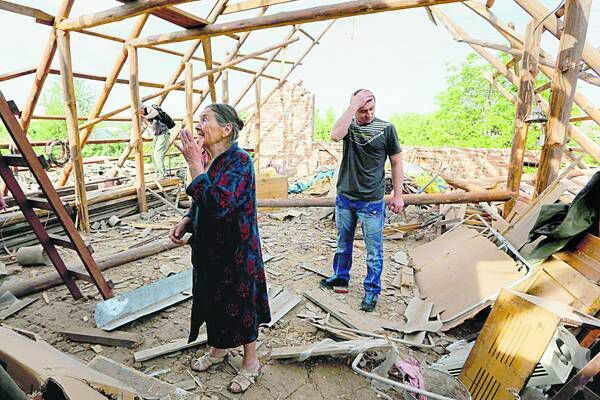 Hostilities as such had not yet taken place, but they had taken place somewhere on the outskirts of Slavyansk. There were skirmishes, people were killed, although in the city itself there was no firing. But on the first day the emotions of people were going wild, and it was very difficult to give a correct evaluation of what was going on, understanding that the line had already been overstepped for blood and murder. The first cannonade I also heard in Slavyansk on one my following visits, when the whole city was regularly attacked by artillery. And then there were already different cities and different attacks. Oddly enough, after this, it became clear that this was a real war, that everything was serious – and it became easier. In such moments of crisis people usually open up. And often with a good, even heroic side…. Can you relate any incidents that you remember? I will relate them after the war. We are not actually located right on the front and do not participate directly in hostilities. Heroism is basically shown there. 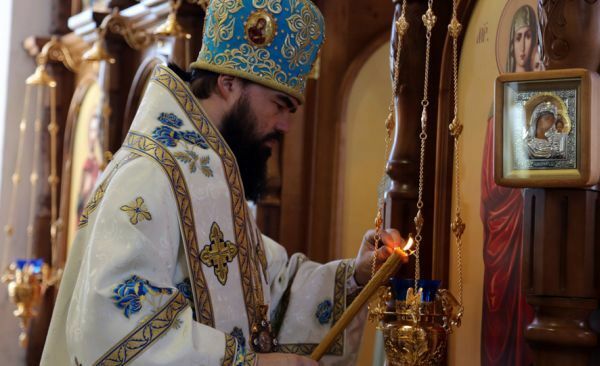 One sometimes hears that the war in Ukraine is a sacred war, almost like the Battle of Kulikovo… Belligerents on both sides repent, go to Confession, and go to Communion… How can you comment on this? Thus it always was in our life; it has just become more apparent during wartime. Take one parish: at the parish everyone goes to Confession and Communion, but there are two camps within the parish, which do not associate for various reasons. I have seen this happen; it was necessary to look for what had happened. Or in family, the same thing happens: they Confess and Commune, but do not talk with one another. On the other hand, stands “a hundred Jesus Christs” so they are called. Also with a flag, also with a depiction of the Savior, with “God is With Us,” and other attributes of the church present. These people gladly kill one another, shoot machine guns, and canons. The hundreds of Jesus Christ are against the Orthodox army, and the devil laughs about it all. Of course, the Lord does not rejoice in this, and this cannot be in any way connected with the fact someone Confesses and Communes. In my opinion, what happens then is that someone places his own system of coordinates higher than the Law of God. Some are ready to Confess, Commune, and shoot their fellows who might differ from them in views. For others it is the same story, only in reverse. If only our system of coordinates of the law of God and the Gospel were in the first place, and this would determine our actions, then Christians would not begin to shoot one another. This would simply be impossible, because the Lord says: you will know whether you are My disciples, by whether you have long among each other. Thus, in that system of coordinates that man has thought up for himself, Confession and Communion are present, but they are on a place that absolutely does not determine their behavior. It does not determine what one is prepared to go to and one is not prepared to go to. We have not learned to place God at the center of our lives; we have not learned for his Commandments to determine our actions, though there are some Christian traditions in our lives, and therefore it seems to us that we are Christians. But no matter what flag you raise, and no matter what you call yourself, you are not a Christian if you do not follow God’s will. “Not everyone who says to me, ‘Lord, Lord,’ will enter into the Kingdom of Heaven, but one who fulfills the will of My Father,” thus it always was. Look around: this happens in times of peace, and how much more does it happen in times of war. In the past moths many priests have left Ukraine, both the territory where the military action is taking place and in quieter areas. What do you think of this? Can a priest leave his flock? Can one say that this is a right owing to extraordinary circumstances? When one gets married, a priest takes one around the analogion with one’s bride thrice. They chant: “Isaiah, rejoice” and “Holy Matryrs,” “Glory to Thee, O Christ God.” Before the wedding rite a betrothal is made, the ring worn on the hands of the bride and the groom. 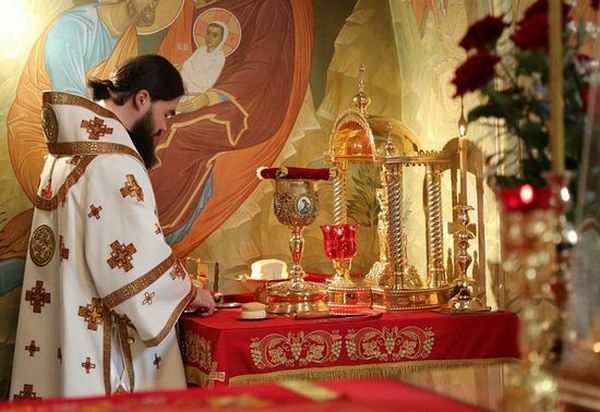 Therefore, one a young person wants to become a clergyman, he removes this ring with which he was engaged, and he is lead three times around the Holy Table. He does not abandon the family, but he does have a wedding with the Church. He goes around the Holy Table thrice, just as he was once led around at his wedding, and he makes prostrations, asking God and the bishop for make him a servant of the Church, so that he will service the Church, so that he will be united with it once and for all with the union of love. Now imagine a young priest whose wife is seriously ill or has had an accident. He is young, promising, interesting, beautiful, and strong. Will he be justified if he throws his wife away and finds a new family, with which he can live an interesting, cheerful, and healthy life? But let the sick wife deal with her own problems. What would you call such a thing, how must it look in the eyes of others? Therefore a priest must stay in the parish when all is well, when there is a flock, when there is love and respect for others, which there is some perspective for the future, some income, and throw away his flock when it is sick, or it is difficult for him, or when it is unwell? Can this be somehow understood or justified? One makes the decision oneself. I as a hierarch cannot make a priest make one or another decision. If he has given up the parish, taken his family, and gone somewhere — that’s his problem, but I cannot accept such a thing. In my eyes such an action is incorrect; there is nothing that could justify this action. I am certain that a priest should always be with his flock, under any circumstances. We, for example, cannot think of a story in which the captain gives up his ship and floats away to another, letting this one sink. There have been such cases, but it is a shame for the captain. We cannot imagine when a normal husband would quit his sick wife and their children, because it is unacceptable. He will be with them until the end and will take care and help them – this is his love, his faith, his struggle, his patience. And why for the priest to remain with his flock must there be something supernatural or extraordinary? How can a commander throw his unit during a fight? Why must a priest throw away his flock? Why are we talking about loyalty oaths as something extraordinary We must remove this pathos. So it must be, and everything that should not be discussed, and unfortunately we have other examples. Most of the clergy, and I thank God for it, along with their families and their children share everything that has fallen to their congregation and parishioners to survive. I think they are doing the right thing. 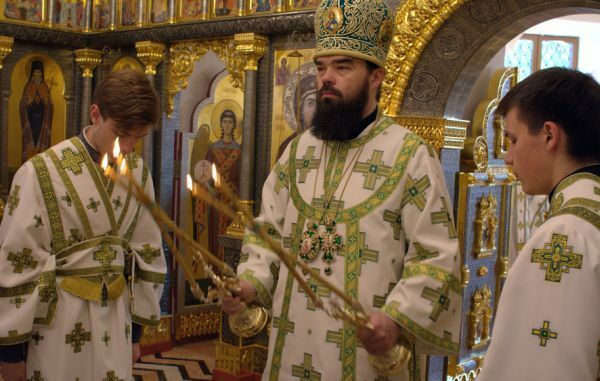 It seems that now there is some pressure on bishops to sign a letter calling for an autonomous Church in Ukraine. To whom would a schism be profitable? A schism might be beneficial to anyone, except to the Church itself – the flock itself, and the clergy, and the believing people. In Ukraine the topic of a schism was first artificially implanted by a policy; it was not an internal church movement. There were people who, for one reason or another, found themselves outside the Church. And there were politicians who actively supported their move towards a schism. Nothing would have happened if Kravchuk had not supported Filaret in his time. And their motives were not religious; it was not done for the good of the Church. Today I do not see that it would be for the good of the Church for someone to secede. Politics again urge in this direction; the memorandum of which we recently heard was not an inner-church document. It was an attempt first to organize pressure on the ruling bishop, seizing the churches on his canonical territory by force, and then delivering an ultimatum: if you do not sign a document, we will take more churches. In such circumstances, what can one sign, what can one say? I think that these people who are trying to make use of the given political situation, to worsen the schism, ultimately won’t achieve anything for one simple reason: time will put everything in its place, and people will understand. 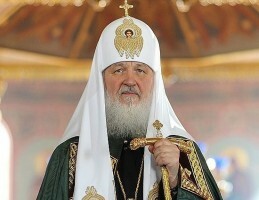 I had a case when I was stopped at a checkpoint and asked by one soldier: why don’t you join the Kiev Patriarchate? I told him what the clergy are doing so that, in this difficult situation, there continue not hatred and enmity, but rather an opportunity to talk about some kind of reconciliation. And he accused me of subversive actions against the unity of the country, against the unity of Ukraine. I then asked him: fine, then explain to me why on the territory of Gorlovskij Diocese there are no captured temples of the Kiev Patriarchate, no Greek-Catholic Churches selected? 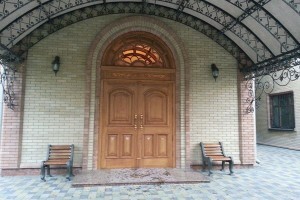 On the contrary, at the request of our Synodal Department for External Church Relations, we regularly ask that a Greek-Catholic priest be freed or a pastor of the Seventh Day Adventists, and petition that the building that was taken away would be returned so they could gather there for prayer. When we were offered the use of force for seizing a building, we always consciously refused. Why? Because the Church is not only Orthodox here. 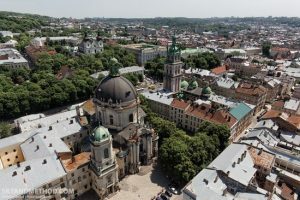 The Church is in Lviv, and in Ternopil, and in Kiev. 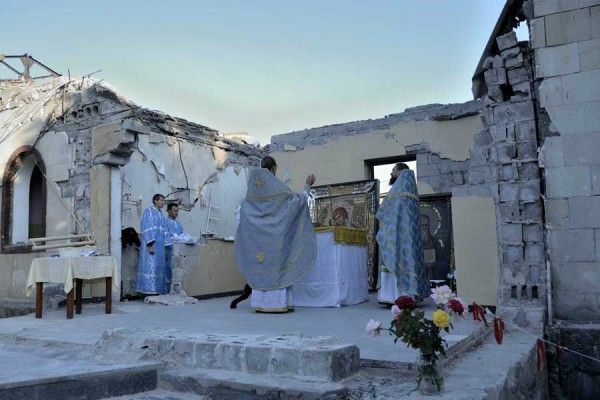 If we forcefully seize our churches here, then whey do representatives of other confessions seize our churches in Western Ukraine. That is, being in a combat zone, we think of the unity of the country more than those who are its flag and force people to sign some kind of memoranda. He could answer me nothing, which is why I continued to travel peacefully forward. In fact, we do not allow ourselves any force in solving any religious questions, because it is futile. One cannot use force in such situations. A time will come, and everything will fall back in place. Let’s grant that today I seize a church of the Kiev Patriarchate. 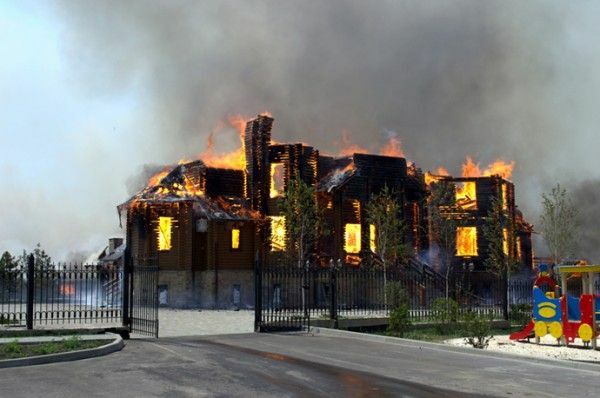 I have this situation in the city of Gorlovka: our church, which we built on a vacant lot, was destroyed by two direct hits. First the church was hit, then it was completely destroyed. Across the street is a church of the Kiev Patriarchtate, which no one touches. On the contrary, the Internal Affairs protects their rights. We do it consciously. We strongly contriubute to the fact that there were no seizures and harassment of those people who want to pray. And if everytbody thought that way, then we could probably decide among ourselves how to live. If politicians wouldn’t interfere in church affairs, the schism would be overcome by itself. We have the strength, and means, and desire to overcome this schism. But today we see that politics are in the first place, and politics try to use the Church as an instrument. That’s something we don’t want. The separation, grief, aggression, and division into conflicting camps: how to overcome it, as you can return the peaceful mood in the minds and hearts of the people? Is it at all possible? For that, time is needed. And one does not need to make the mistakes that the politicians made. There is no need to carry over the conflict that exists in the state into the spiritual environment. Priests need to understand that the war is over, and life will go on, and you will need to speak with different people from different sides of the barricades. You will need to have the appropriate authority, and for this it is necessary that the Church not be drawn into this military history, so that it does not become one of the conflicting parties. It is necessary that the priest not lose his ability to be a shepherd for any of the parties in the conflict. Patience, time, and prayer that the Church remain in its place, and not be tempted to become one of the parties of the conflict – this is a prerequisite to peace to come, and we are obliged to keep these prerequisites. And when that will happen, we do not know. What is the right way now to help your diocese and people? We are approaching a situation where many people will need the essentials. Today we have nearly 1,0000 people who are fed daily in the parishes of Gorlovki. That is the maximum of our capabilities, and there are many more people who need help. Their number, I think, will increase with every day. While we are not able to bring some humanitarian aid because it’s a war zone, the diocese is divided into parts, and this creates certain difficulties. Perhaps in time it will be necessary, and this should be done until people are able to stand on their feet. If we will turn to the relevant appeals, when it becomes possible, I would that help be provided.